I woke up around 7am from my 2 hour power nap and felt better than I had at 4am. My team mate cooked up some bacon and I munched on some coffee cake while waiting to hear the plan for the day. Our first turn-in was going to be chicken at noon. We still had some time to kill but even so, it feels rushed. The butterflies were starting to flutter in my stomach, the anticipation was starting to build. Was our meat going to be cooked? 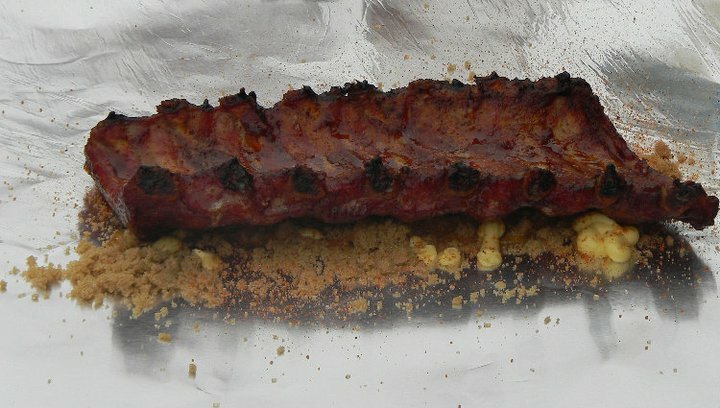 Would our ribs have the right coloring? What catastrophe could happen today? Would it all just run smooth and I was just worrying? I looked at the sky and saw the same thing I had the day before. No sun, not one spec of blue showing through the clouds. It didn’t look good. Everyone had assured me the day was supposed to be beautiful. I wasn’t buying it. Even with bad weather the show must go on. We had to stay focused on all of our meat categories. Being sure that we were putting everything on at the right time, pulling them off at the right time, assuring the quality of what we were about to turn in. 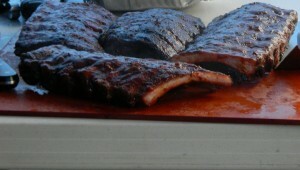 The ribs seemed to be the ones that needed the most attention. 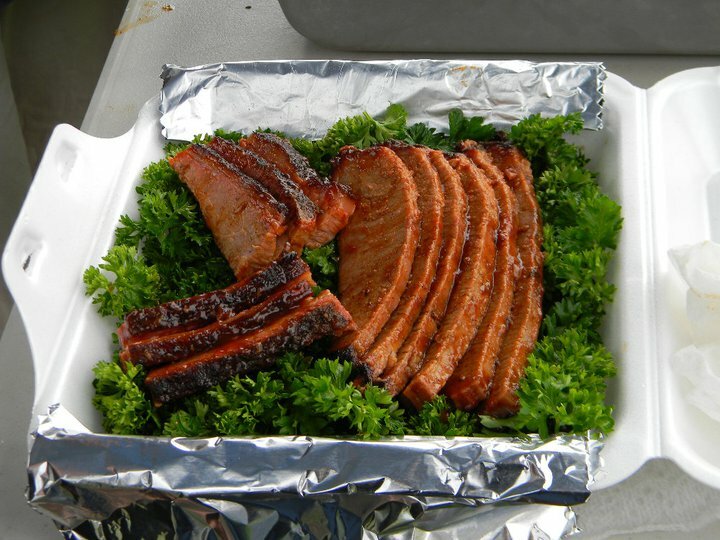 There’s so many steps from smoking, seasoning, wrapping and all have to be done at the perfect time. When chicken was ready to be put in the smoker people were starting to panic saying a storm was headed our way. 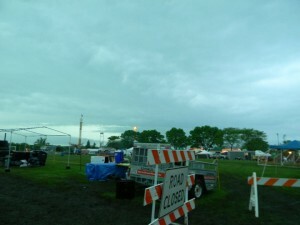 We had already dealt with a bunch of rain the night before so people weren’t entirely concerned about this. We pulled our smokers under our tent in anticipation of this storm and continued on, business as usual. We were nearing turn-in time. It seemed about every 10 minutes we were getting updates from the people who worked for the competition saying where to evacuate to, bad storms were heading our way and we need to seek shelter. This may be bad to admit, but not one person left their tent. We were all determined to get to our turn ins. Our main focus was on chicken! Nobody felt the need to leave their precious smokers. 11:55 hits – 5 minutes until turn-in time. We get our boxed packed perfectly and ready to run to the judges tent. Then we hear yelling “JUDGES ARE NOT ACCEPTING TURN INS – TURN INS ARE CANCELED UNTIL FURTHER NOTICE!”. All we could really do was look at each other and blink in disbelief. The storm hadn’t even started yet. It was just a rumor, what does radar know anyway?! What are we supposed to do with our chicken?! This is a competition that is pretty much based off of perfect cooking times and ability to use a smoker. Do we just stow this away and hope for the best? We had no choice. We had to put them in a hot box and pray they didn’t dry out. We didn’t even have a clue of when the judging would be back on, if ever. We quickly dried off our prep table, unpacked cutting boards and knives from the car, rescued our hot box full of food from the trailer next to us. Luckily the people next to us were fellow co-workers (and far more experienced BBQ’ers) they had a nice big trailer and let us use their shelter to store our hot boxes. I’m sure this gesture was only because we gave them space in our hot box, but either way – it was appreciated. Luckily our chicken was still nice and warm for being stored in a hot box for two hours. Cambro sure makes a great product! We loaded our box and were ready for the 2pm turn in. The turn ins continued as planned. Ribs at 2:30, Pork shoulder at 3:00, Brisket at 3:30. We were prepared and ready to go on time for each turn in. Everything seemed to be falling back into place with no serious concerns. Between turn ins we kept trading meats with our fellow co-workers at Sweet Baby Rays, critiquing and socializing and sharing our relief of the storm letting up and allowing this to continue as planned. After final turn in, there was no clear indication of when awards would be. It was originally scheduled for 5pm, but we were all sure that wouldn’t be the case any longer. I decided to run to Target to finally get into some dry clothes. Between the rain, and having to wash dishes rapidly between turn-ins and getting sprayed with the hose from hell, I was soaked, cold, and tired. I felt a nice warm pair of fresh clothes with put me into better spirits. I got myself a new sweat suit, warm and dry once more! I also couldn’t resist a nice hot mocha from Starbucks. I headed back to wait for awards. I was surrounded by friends and family waiting patiently to see how we did. I’m sure they regretted this when they arrived at 5pm and awards didn’t happen until 7pm. I sure felt loved though! 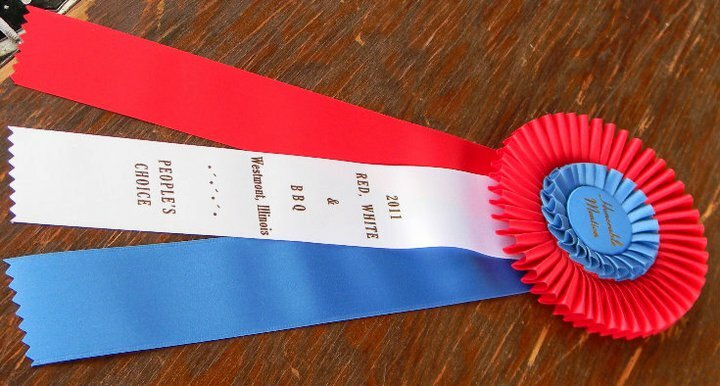 The first award announced was for people’s choice chili – my contribution. I totally felt I had this in the bag. Unfortunately I only won 4th. Which I was still happy with, for my first competition it was definitely something to be proud of. Most people agreed that it was most likely due to weather, if we had a better turn out we would have had many more votes. 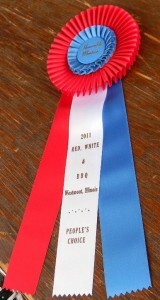 I was still very proud to have won something! Sadly, award after award were read off with no other mention for our team. We did try our best, we worked very hard, and had a lot of fun. We need to learn from our mistakes and push forward and look to the next competition. I would love to make shout out to our co-workers and BBQ team Duce’s Wild. They achieved quite a few awards and yet again did a fantastic job. I hope to get to that point myself. 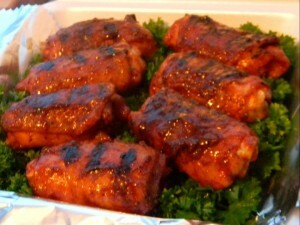 I plan on devoting my summer to learning all there is about smoking and BBQ. I wanna blow them outta the water next year! Even though this competition was the worst possible representation of what competition really is I felt it was a good thing to see for my first time. I mean, how much worse can it possibly get?